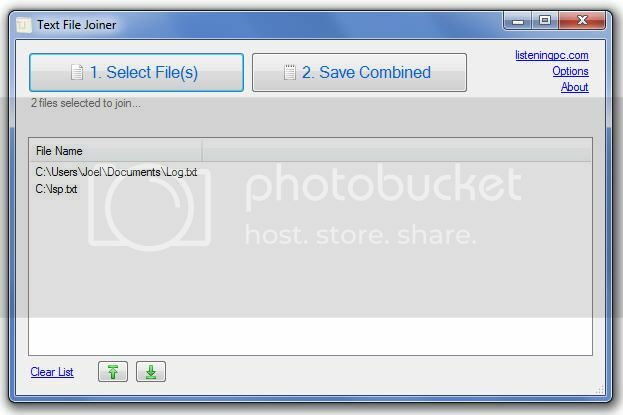 Text File Joiner is a freeware that allows you to join multiple text files and create a single text file. It’s pretty easy to use. You can combine several text (.txt) files in jus two steps. Firstly, download Text File Joiner and install it. Once done, start Text File Joiner. Click Select Files button to browse and select multiple text files. Now, Arrange the order of text files using up/down buttons at bottom. Once you are done with arranging them simply click on ‘Save Combined button’ to generate a single text file.